I just have to share this new product, Tombow Xtreme tape runner! I was sent this product to try out and I’m very pleased to report that it is awesome! I’ve used it in a couple of workshops as well with great results. 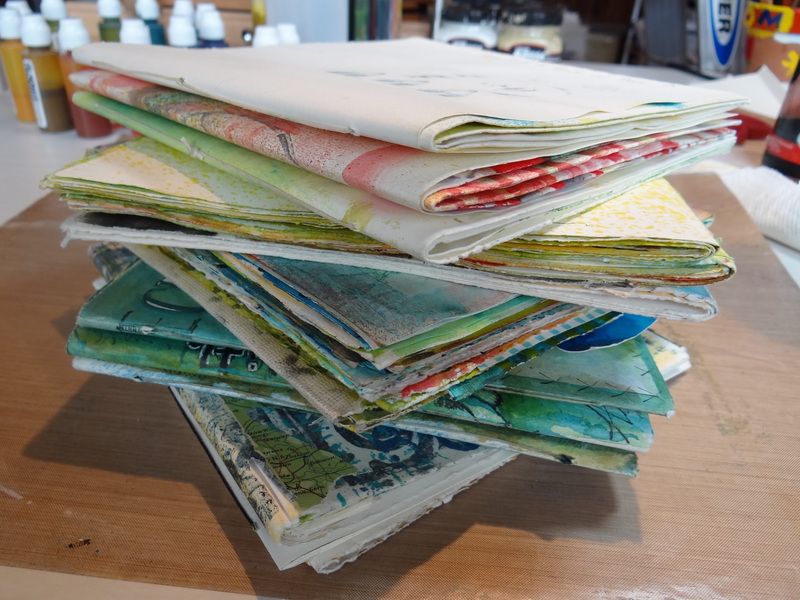 The hold is amazing and I’ve found it to be just what I needed to quickly and easily create handmade journals in class, when you want great staying power and no dry time. 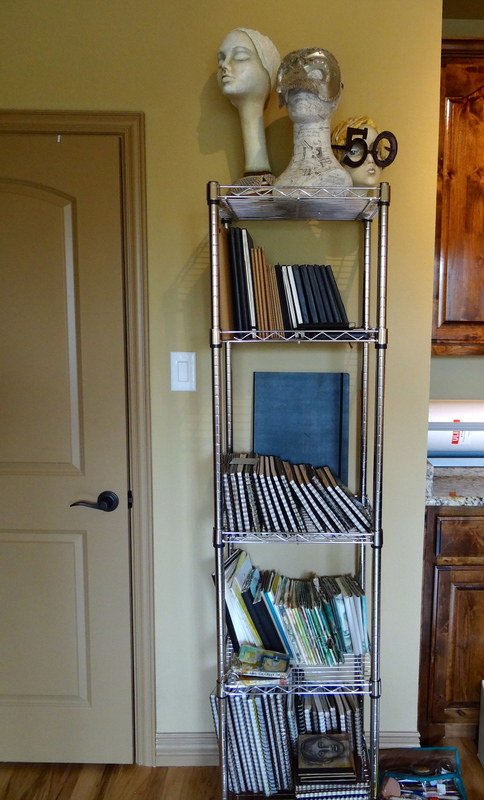 When I sat down to actually make one to blog about I looked right at my journal shelves and decided to tackle a bit bigger project than just making one journal. As an in structor I end up with a lot of sample journals and some of them you can see here on the second from the bottom shelf. I’ve been wanting to bind several together to make larger, more substantial journals for some time and well, today’s the day! 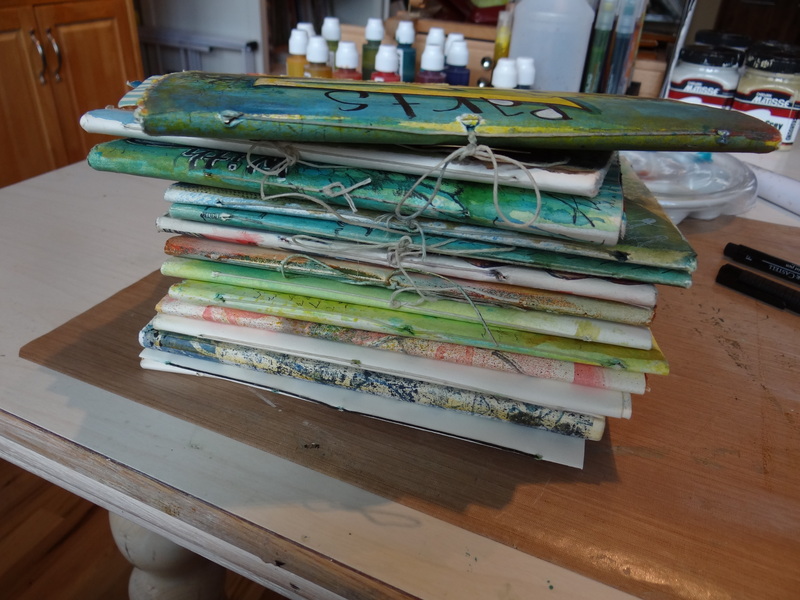 So I grabbed a stack and then divided them into groups of three, which seemed about the right size and weight for the journals I wanted to make. Because these are all made using the 10 Minute Journal Binding from my first book, Art at the Speed of Life, the outside stitches are all the same, two long stitches on the outside. If you’re making signatures from scratch you can see this blog post showing how I do that. 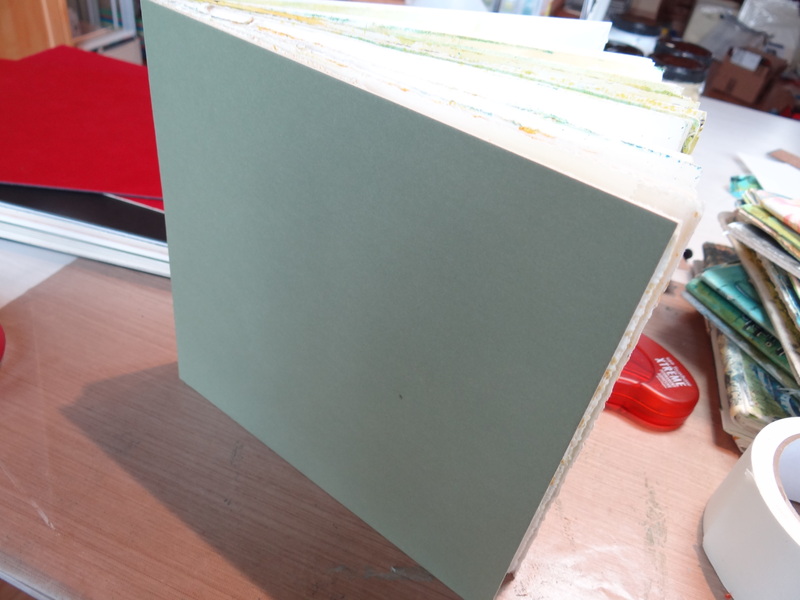 Next I used a scrap of chipboard to thread some cloth tape through the outside stitches, securing the tape on both sides of the journal stack. 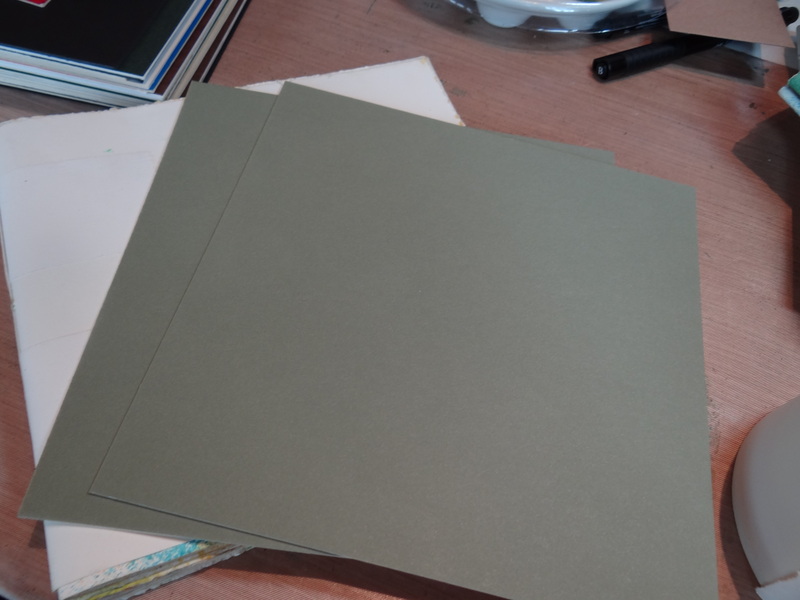 Next I cut two pieces of matt board to the size of the journal. These are matt board blanks, what is cut out of matts made for pictures. I get them in bundles at Michael’s and they come in handy for many things. 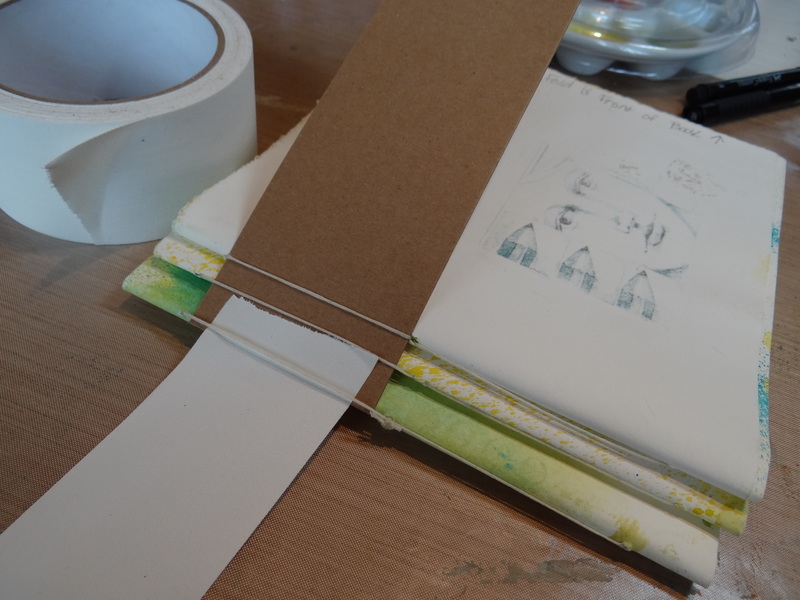 Using the Xtreme Tape Runner, apply the sticky film to the back of the matt board and then stick right to the first and last pages of the bound journal stack. 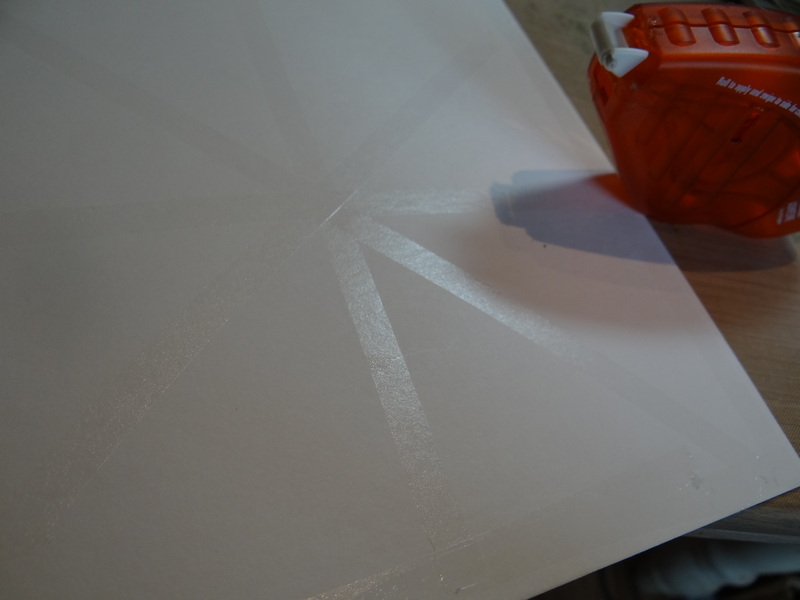 The trick to using a tape runner is to let it do the work-you don’t need to press hard just maintain an even pressure and speed as you guide the sticky where you want it. Side swipe to break the sticky film. 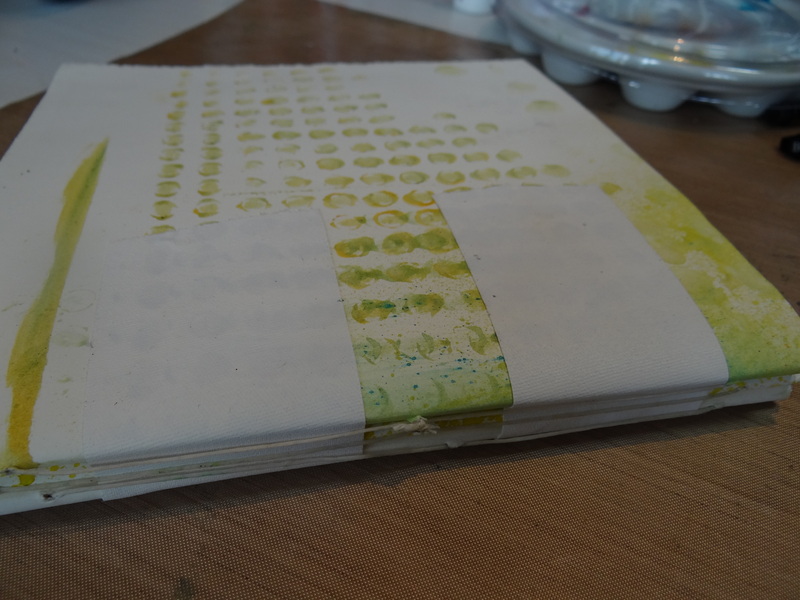 Once the covers are attached use some cloth tape to cover the binding. Now I have one journal, nicely bound instead of three small ones. Now my shelves look a bit neater and I’m motivate to go through my teaching supplies and dig out the rest of the samples from old workshops and bind them up too! This motivates me more than you know! Thanks! It’s awesome designed for me to have a site, which is valuable for my knowledge. Thanks for the great little lesson. Love your work. Nicely done. Thanks for the heads-up about the Tombow product. It might be just what I’ve been looking for. Thanks Pam. Great idea for christmas gifts too. This is a very helpful post Pam. Can you get the cloth tape anywhere? What a great idea to use matt blanks! Very sturdy and clean looking. Thanks so much for sharing. Yes, you can get linen cloth tape at any framing/art store and online. You can also use medical cloth tape or hockey/sports cloth tape. Thanks for this-makes me want to go make more journals. 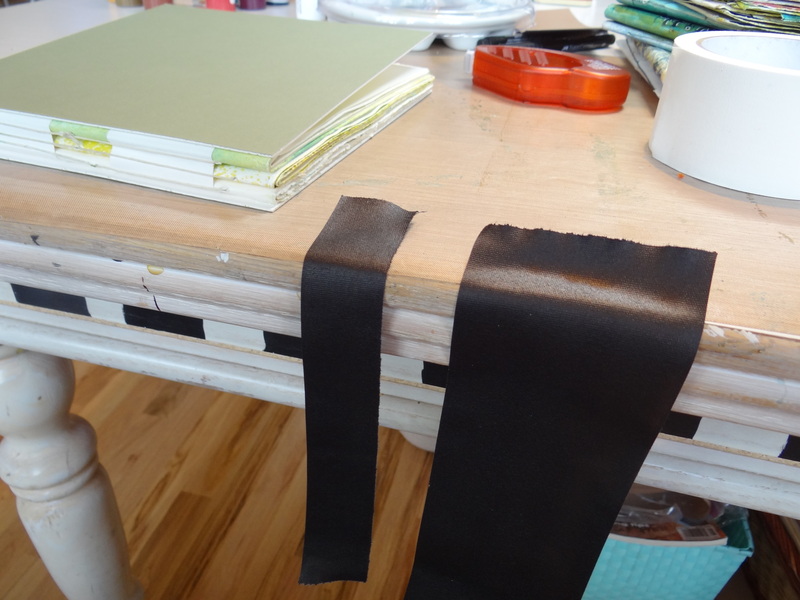 What’s the smaller black take inside the bigger black tape- were you just making a void space for the journal backs by having that direct part be nonsticky? Was it just a smaller part of the same tapes nonsticky side? Thanks! As I become addicted to making the 10 minute journals, I can see how this trick will be handy in the future. Great tutorial, sister.